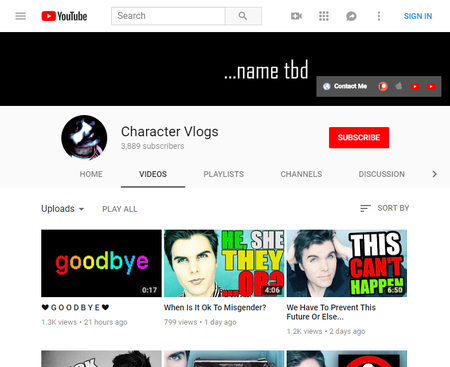 Character Vlogs was a channel Greg created in August 2018. Greg discontinued the channel 18 days after its creation. This is the new OnisionSpeaks, only this time, it's not Onision - It's just Character. Similarly to classic Speaks, Greg would upload videos of himself sitting in front of a camera, talking to the camera about his views. Although, viewers pointed out these videos seemed less genuine than his old Speaks videos because it was obvious he would film multiple videos in one sitting and upload them throughout the week. (Source) His old Speaks videos were either covering a topic his fans were discussing that day on his Onision Forums or more off the cuff talking about something that was on his mind that day, sometimes even filming right after he got out of the shower. It even because a bit of a meme that Greg would film serious videos with drenched hair. On September 18, 2018, Greg announced his departure from the channel with the video "❤ G O O D B Y E ❤". The video was a text video directing fans to Onision, Speaks, and UhOhBro. ($ource) At the time of abandonment, Character Vlogs had 3,890 subscribers and 50,523 views. This page was last modified on 19 September 2018, at 09:41.